The United States Mint is closer to striking a new series of dollar coins. On Wednesday, Jan. 17, the U.S. House of Representatives passed an amended version of the American Innovation $1 Coin Act (H.R. 770). As CoinNews wrote about nearly a year ago, H.R. 770 calls for a 56-coin program with dollar reverses celebrating a significant innovation, an innovator, or a group of innovators within each state, the District of Columbia and the five U.S. territories. Obverses would depict a likeness of the Statue of Liberty that extends to the coin’s rim and was large enough to provide a dramatic representation of Liberty. "The inscription ‘United States of America’ and ‘American Innovators’ and a representation of the signature of President George Washington on the first United States patent issued." American Innovation $1 Coins would be issued alongside the current series of dollars honoring Native Americans and their contributions to the development and history of the United States. Dollar coins have not been released into circulation since 2011. The U.S. Mint strikes them in circulating, proof and uncirculated qualities solely for coin collector products. H.R. 770 would make no changes in that regard. 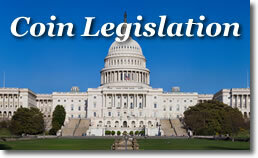 For the bill to become law, it must pass in the House, Senate and get signed by the President. It currently resides in the Senate’s Committee on Banking, Housing, and Urban Affairs. In mid-2017, the Senate introduced a companion bill calling for the same series. Here we go again…another unnecessary coin series which generates yet more coin albums to fill…doesn’t anybody in this process undertstand coin designs and series the public will accept? Seems like they are just making commemorative coins now just to keep people employed making them. John F. Kennedy set made sense..50 years.. March of Dimes and association with Roosevelt made sense…These random ones…not so much. Where is the originality of both design and substance with the modern coin movement that inst, as Jan stated” meant to fill a hole in a coin book? Mintages? For collectors anything over 100,000 is absurd, i don’t care how many times you repackage it. I agree, this is totally a waste of time and money unless you are going to put them into circulation and eliminate the current $1 bill. u.s. mint, if you are listening—-please don’t do this. Never, and I repeat, NEVER in US history have people WANTED a dollar coin. Do the homework and find out this extends all the way back into the 1800s. I was surprised when homework taught me this was true even with Morgans. What is the actual motivation behind these losing things. They wasted so many billions with the preseidential ones that are now in STORGAE at taxpayer erxpense. The SBA’s ended up as Balto. city subway tokens and also in storage. The US mint is actually NOT a government organization – so how do they keep getting approval so they can make profits on this wasted effort? And, of course, its gimmicky. The RCM has already tuned off Canadian collectors b/c its so gimmicky and produced so much excess per month now. We are headed in the same direction. Maybe president Trump will have enough sense to veto this insanity. I believe our mints have a social responsibility to annually show case our country’s history and achievements. As a proud Canadian, take a look at my mint (RCM)…they pump out the coins annually like every year is the last year of coin production, so I fully agree and understand that enough is enough. Its not about quantity, its about quality. Take time to celebrate our country’s history, beauty and achievements, but give the market quality over quantity. I agree with Daniel. This is a useless money-making scheme unless and until Congress gets the spine to stand up to the nay-sayers and Crane Paper’s lobbyists, something about as likely as flying purple pigs. Even though dollar coins work in almost every other major country on the planet, we’re too resistant to anything new or different to dump a bill that’s essentially the same since 1928 and wastes huge amounts to print and process. Heck, if people insist on “foldin’ money”, get rid of the One but issue a modernized $2 bill at the same time. You’ll only ever get a single $1 coin in change and the BEP’s print load will be cut in half. Crane Company of company town Dalton, MA was sold in December for $800 million to another unrelated company after producing the 75% cotton, 25% linen material for USA banknotes for 140 years now! The family finally gave up the ghost & cashed in their poker chips! Lbrewer42 – Hi, you say in your blog that the the U.S. Mint is ”actually not an government organization”. What type of an organization is the U.S. Mint, and who owns the U.S. Mint, and where do they get their cash$$$$$$$ from to mint all these ”circulating” golden dollars so they can ”hoard” them at the expense of the U.S.* tax payers, and do you have an opinion on why our U.S. Federal Government* is stashing them away, what are they going to use them for, is there something ”we the people” don’t know ”YET”?, my curiosity has the best of me on this one, just the curios George i* am, if you wish to answer my ?, you would be very helpful, Thanks!, if not, may you* & yours* have a very good*+* new year. Seth – thanks for the update! I obviously missed that development. My guess though is that the new owners will be equally obdurate in opposing any modifications to our currency system, in order to maintain their monopoly and profits at taxpayer expense. US Mint is belong to US Treasury Department, but USPS not. That why we type US MINT.gov.com . Coins have metal value , paper currency don’t have anything to support their value , just US MONTEREY SYSTEM to defend or support it. I feel coin are more better value . May be USA will return to gold and silver standard to support new currency crisis.